Live Jazz begins 8 a.m.
Our wonderful outdoor courtyard and patio bar is dedicated to the preservation of New Orleans Musical Culture, One Legend at a time. 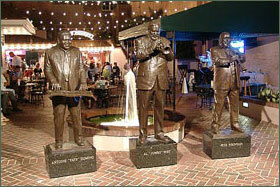 Take a memorable photo with nearly life size bronze statues of Al “Jumbo” Hirt, Antoine “Fats” Domino, Pete Fountain, Chris Owens, Ronnie Kole, Louis Prima, Allen Toussaint, and Irma Thomas. Feed all your senses: the music and cuisine are the heartbeat of New Orleans. 334 Royal St, New Orleans LA 8 a.m. - 10 p.m.
600 Decatur Street, New Orleans LA 8 a.m. – 10 p.m.